Cheers! Happy Aloha Friday! 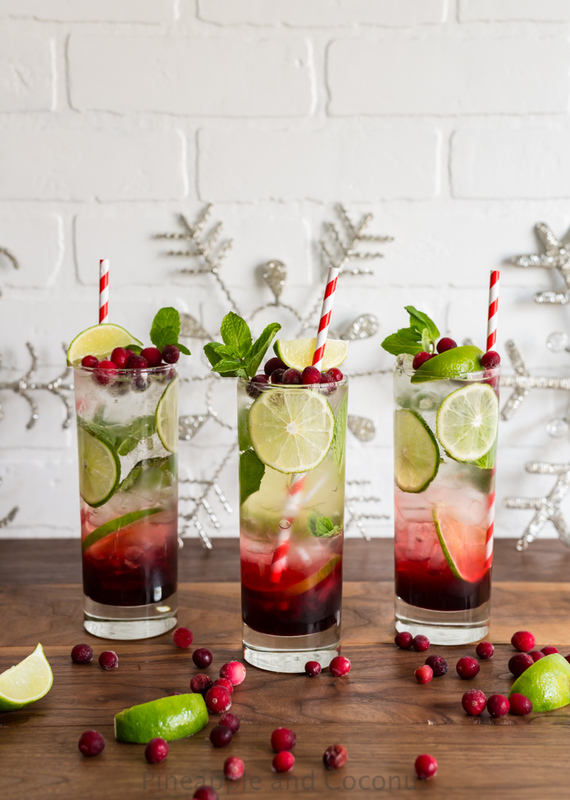 Spiced Hibiscus Cranberry Mojitos are a perfect way to start off December! I am a strange person. I love summertime, I love the heat, sun, warm water, warm sand. I am like Olaf the snowman from Frozen. But then when Christmas comes around I love all things Christmassy and cozy. 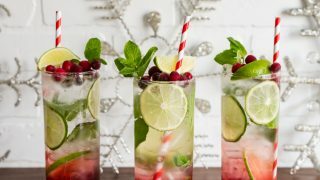 So to compromise, I took one of my favorite summertime cocktails, the mojito, and made it into a colorful Christmas cocktail. 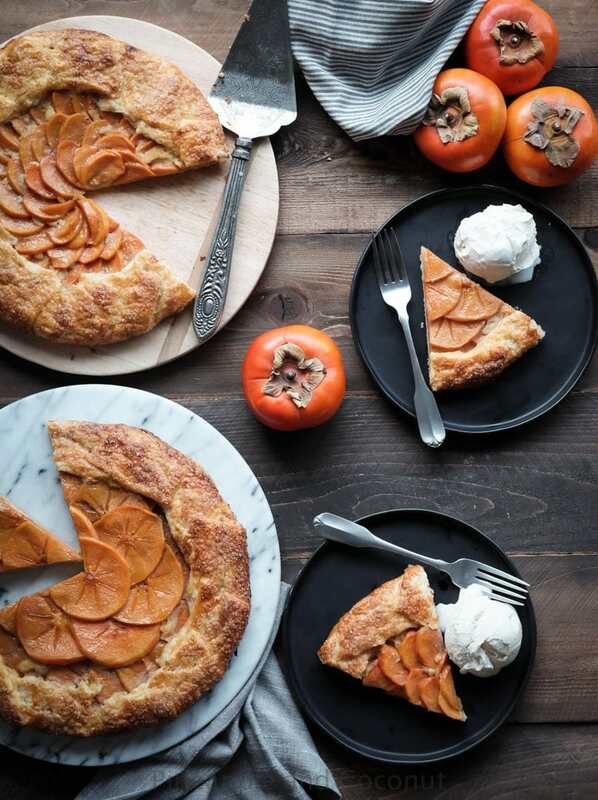 Earlier this week I started out with my Quince, Cranberry and Persimmon Crisp which highlights my favorite fruit of winter, the persimmon. I wish I still had some of that left to eat. It was so so good. It would pair quite nicely with this cocktail. I am all for cocktails and desserts! 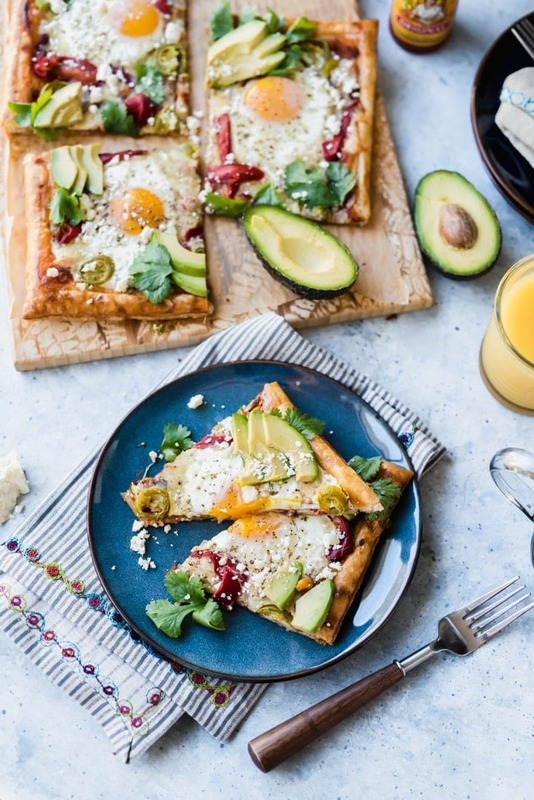 I always tell my husband we should go out for cocktails and desserts or cocktails and appetizers only. By the time the entree rolls around I am full because I am a snacky person and like little bites to try with drinks. I end up taking so much food home! A couple weeks ago I made a cocktail recipe with this AMAZING Hawaiian spiced rum from Koloa Rum Co. and I knew I wanted to make another holiday recipe with it. They also sent me a bottle of their white rum which I am using in another fun cocktail this month! But for this mojito I wanted to make it with the spiced rum and I am so glad I did. 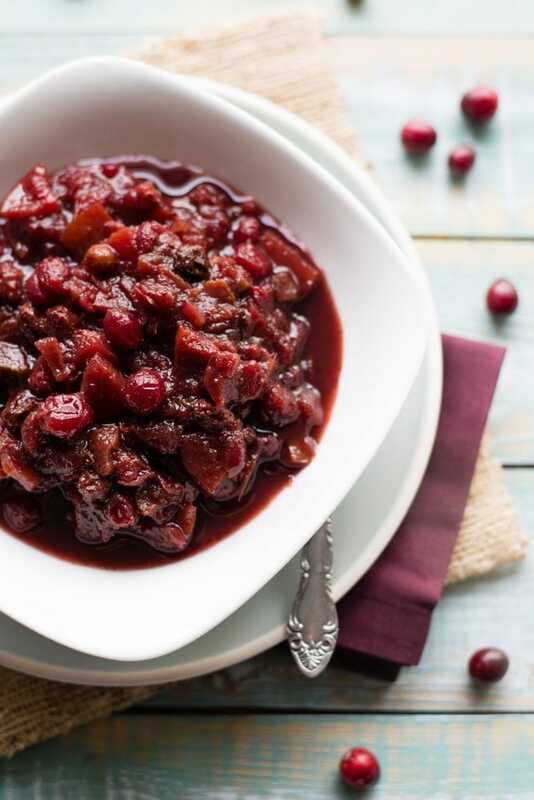 It is so good with the hibiscus simple syrup and white cranberry juice. I made the hibiscus simple syrup with dried hibiscus flowers I ordered off Amazon only because Whole Foods was sold out of them when I went looking for them and I figured one day shipping would work for me with Amazon. Hibiscus tea bags would also work as long as its 100% hibiscus leaf. The simple syrup can be made ahead of time and kept in the refrigerator. 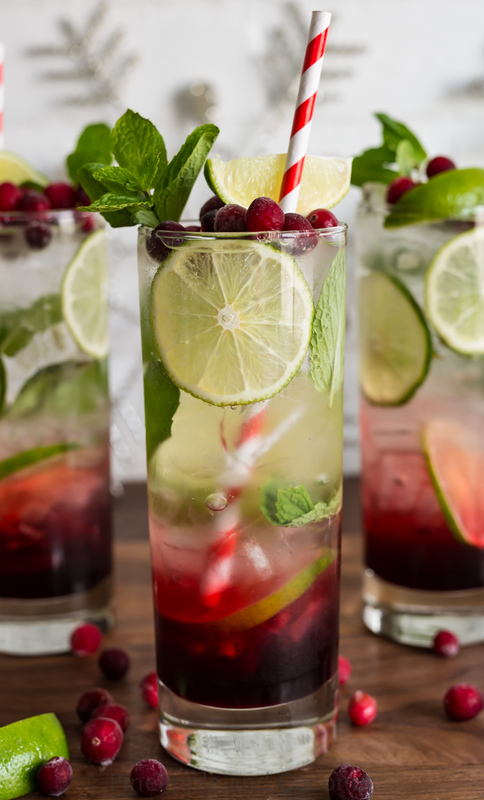 I use simple syrup in mojitos because I find muddling the mint with sugar and lime doesn’t always dissolve the sugar and the sugar stays at the bottom of the glass. So simple syrup it is. I also wanted to go for a layered effect so instead of mixing everything in a cocktail shaker I layered in some of the hibiscus simple syrup with a little mint and muddled that. Then added in ice and a lime slice to keep the syrup more towards the bottom of the glass. Keep layering with ice, mint and lime slices until the glass is full of ice. In a shaker cup I mixed the Koloa Kauai spice rum and white cranberry juice and added that to the glasses and then topped with soda water. So while the rum is a gorgeous amber color, the cranberry is a pale peachy yellow and the soda water is clear the top half of the drink looks more clear and gives that lovely layered look. Once you start sipping and stir around the syrup from the bottom of the glass the drink turns that pretty hibiscus red. I am pretty sure we ate our body weight in popsicles this summer. We discovered a brand that had a hibiscus mint flavor that I fell in love with. 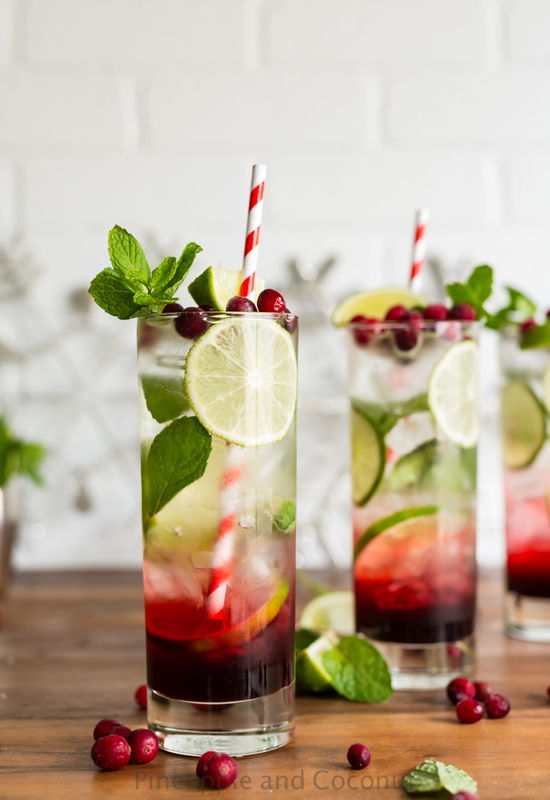 So refreshing, sweet-tart and minty. 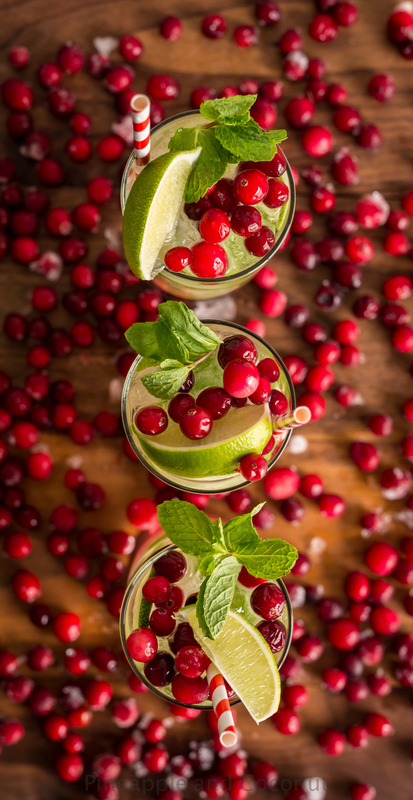 I knew that would make for an amazing mojito flavor, and of course I had to add in cranberries to give it a holiday feel to it. 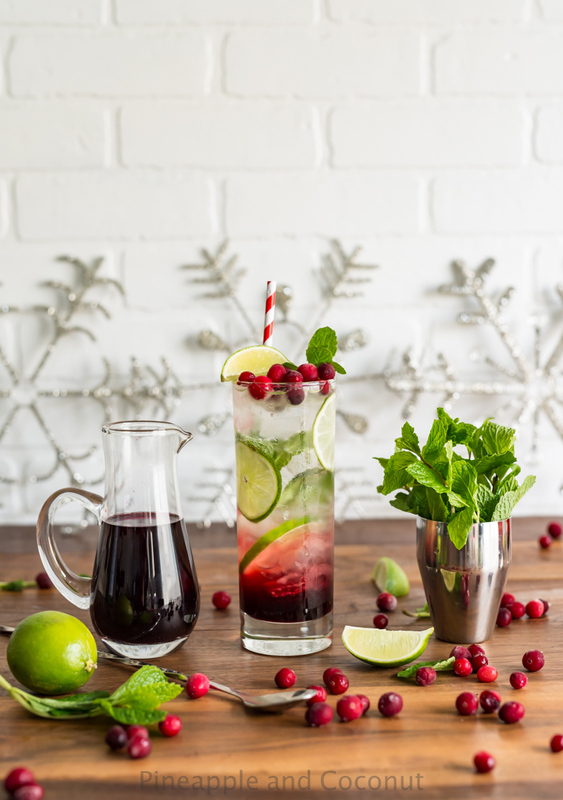 Spiced hibiscus cranberry mojitos – a perfect Christmas mojito. 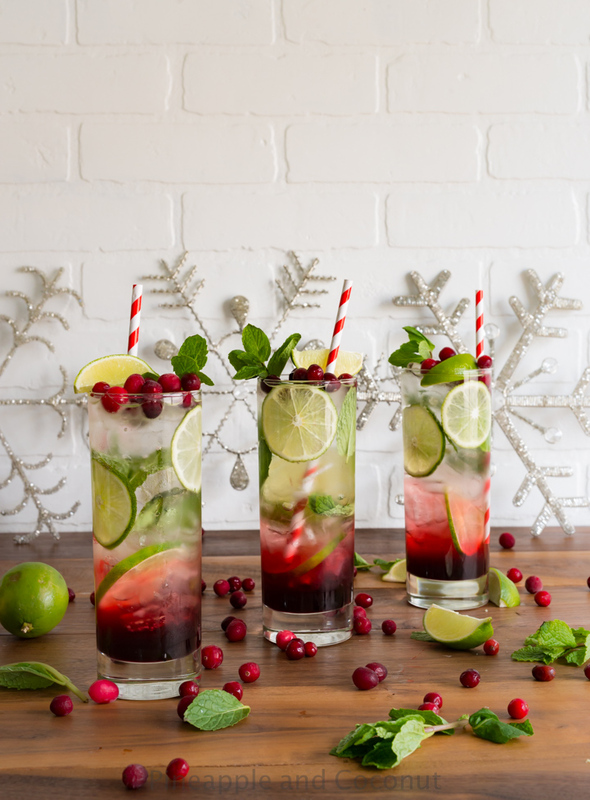 Spiced Hibiscus Cranberry Mojitos www.pineappleandcoconut.com #christmasweek Makes 4 large mojitos. In a small saucepan over medium heat combine the water, sugar and hibiscus leaves. Stirring until sugar dissolves, bring to a boil then remove from heat and cool. Strain into a jar to remove all the hibiscus leaves. Chill syrup completely until ready to use. if you can’t find white cranberry juice you can use white grape juice or regular cranberry juice. 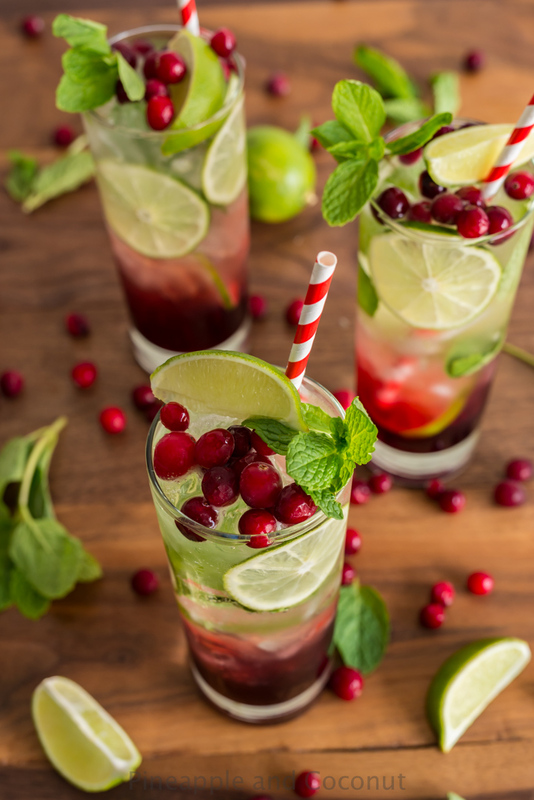 If you use regular cranberry juice you will have an all red drink and not get the layered effect as seen in these cocktails. It will still taste just as good though. To make the simple syrup with tea bags instead of loose leaf hibiscus flowers, heat the water to boiling and steep 4 hibiscus tea bags (make sure its 100% hibiscus leaf or as close to it as possible) for 6 minutes in the pan, until its very dark red. Remove the tea bags and add the sugar then bring to a simmer and stir until the sugar is dissolved. Transfer to a container with a lid, like a mason jar, and chill until ready to use. Hope your holiday season is off to a good start! 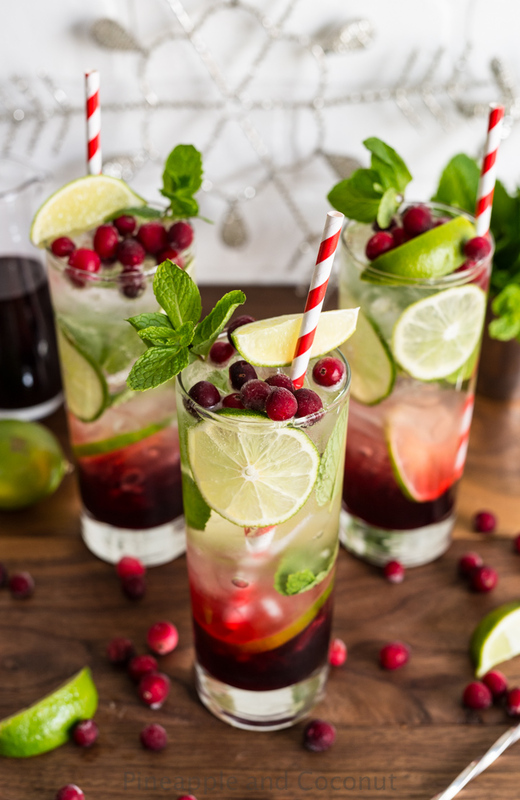 I know these Spiced Hibiscus Cranberry Mojitos will help get you in a festive and tropical mood at the same time!